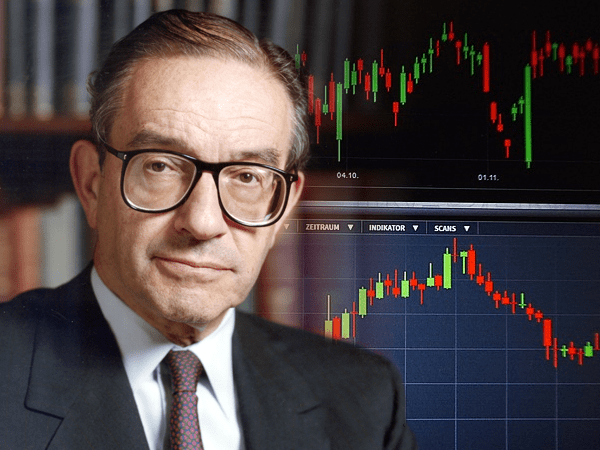 On January 31, two full days before the stock market’s recent sell off, former Fed Chairman Alan Greenspan issued a warning. I think there are two bubbles. We have a stock market bubble and we have a bond market bubble. Experts are always making predictions about how the markets are going to go. However, when a former head of the Fed tells us his opinion, it’s best to pay attention. Appointed by Ronald Reagan back in 1987, Alan Greenspan served as Chairman until 2006 — the second-longest tenure in the Fed’s history. He’s famous for labeling the frenzy which drove up stock prices during the dotcom bubble as “irrational exuberance”. After warning about the stock bubble, he continued by saying the bond bubble would be the most critical. And, despite the Fed deciding not to hike rates during their meeting last Wednesday, he believes the move up in long-term interest rates will have a massive effect on the economy. I think we’re getting to the point now where the breakout is going to be on the inflation upside. The only question is when. We are working our way towards stagflation. Greenspan isn’t alone in his predictions. In an interview with The Telegraph, William White, former Chief Economist for the Bank for International Settlements (BIS), said he believes that we’re in an even more dangerous situation today than we were at the peak of the last bubble. All the market indicators right now look very similar to what we saw before the Lehman crisis, but the lesson has somehow been forgotten. Has the Crash Already Started? With the stock market already selling off hard and fast earlier this week, and noted financial experts voicing their concerns, it’s no longer a matter of if, but when the next bubble will pop. In fact, the bubble may even be popping right now. Fortunes were lost in the last bubble, as both businesses and private individuals went bankrupt. However, those who took notice of the subtle warnings and invested their money elsewhere before the crash made it through with their wealth intact. It’s crucial to note that no other form of investment has stood the test of time quite like gold. And with the next crash looming, now is the time to protect your wealth before it’s wiped out.